We are the Manufacturer & Exporter of PTFE MAle Connector Elbow. Our exclusive assortment of Brass Branch Tee is has gained tremendous accreditation in the markets for its exclusive features like sturdy construction, longer service life and high tensile strength. These are presented in the markets at the industry leading prices as per the industrial quality standards. The Elbow Connector 24 kV-250, 400 & 630 amps Shielded Connector is shielded and insulated termination, rated 250, 400 & 630 amps upto 24 kV, connected with underground cable ranging from 35 to 400 mm 2 (conductor cross section). Meets requirements of DIN 47636 standard. 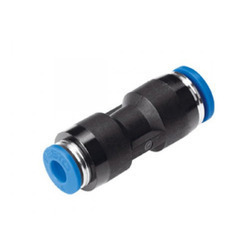 Matching up with the exact requirements of customers, we are involved in presenting wide array of Elbow Connector.